Following a brilliant Pitch Night, we are delighted to announce that Mentoring Plus won our Gig Night. Mentoring Plus' Youth Rep team have a bold vision - their Young Persons Manifesto - that they wish to realise in order to create a better community for young people. A community where there is a kinder education system, more accessible mental health support, and more youth clubs and activities, to help young people realise their potential and be inspired. Whilst the Youth Rep team are 100% committed to bringing their vision to life, they need help from the Good For Nothing community to make this happen. Mentoring Plus need blue sky thinkers, creatives, do-ers, organisers, strategisers, people who truly care about their community and believe that every young person deserves to live a full life. If you want to be part of an exciting social project that is going to deliver lasting change for young people and our community for years to come, then sign up and get involved. There will of course be food and drink supplied by the wonderful Boston Tea Party crew (our treasured partner!) and a room full of awesome people for you to meet. With just under two weeks to go, we asked Mentoring Plus team member, Katy Massey, to tell us how this Gig Night will help them to ignite positive change in our community. For any of our 'Good For Nothing’ers' who don’t know MentoringPlus, can you tell us a bit about what you do and why you do it? We’re a local charity that have been supporting young people across our county for the last 20 years. We match young people with a volunteer mentor and they spend a few hours a week together for a year. Our volunteers are an impressive collection of excellent people from all across our county,trained and supported by us throughout the year. Why we do it? Mentoring provides a simple yet effective way to connect young people facing challenges with their community. It gives them time and space to get out, explore their surroundings and feel supported. 1 in 5 children inB&NES lives in poverty. 50% of homelessness applications come from our under 25s. The number of children aged12-17 caught carrying weapons for protection is increasing at an alarming rate.Mentoring provides a proactive solution to support young people through challenging times in their lives. Our young people tell us that mentoring helps them feel happier, safer and more connected. They are a team of young people aged 13-21 who are passionateabout making changes in their communities. They have engaged in our mentoringprogramme and meet weekly to plan social action projects like homework clubsand pop-up charity shops. They feel passionately about making positive changesto the communities they live in. The manifesto came about three years ago – the group spent a few sessions talking about their aligned values and created the three key points from that. The Youth Reps advocate for better mental health services,more youth clubs and a kinder education system. 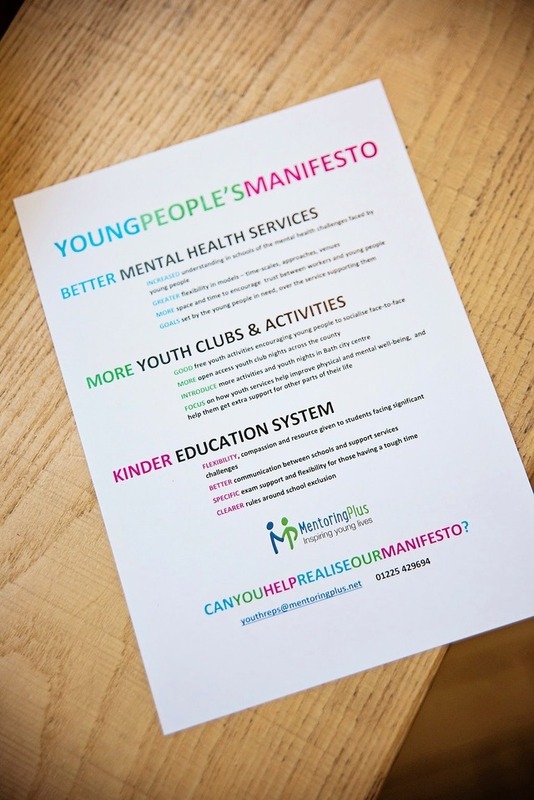 The manifesto is built on their own personal experiences with education, mental health and youth services; the group are incredibly passionate about making changes that will benefit generations to follow. They use it as the basis for all their social action projects and they’ve even taken the manifesto to Parliament! We realise it’s the England v Belgium game – and we promise to deliver a better performance than they do! We would LOVE to see you there – our vision as a charity is for a community in which all children thrive, and our mission is to inspire our community to make that happen. This gig night is an incredible opportunity for our young people to inspire you to get involved. There will be Mentoring Plus staff and Youth Reps around the room to help facilitate discussion around each three points on the manifesto. You may already be drawn to one of the manifesto themes, or maybe unsure where your skill set could help. Either way, we would be thrilled to see you there and put our mission into action. Please sign up to join us on Thursday 28th June at BTP Alfred Street at 6pm.